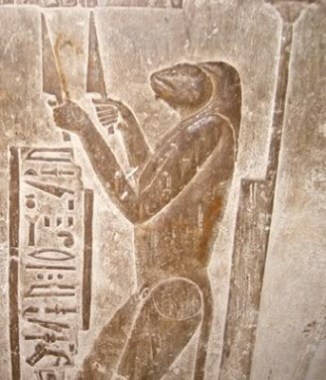 This article contains fast, interesting, fun facts about Heket for research, schools, students and kids providing an insight into the lives and religious beliefs of the ancient Egyptians. This ancient goddess was revered as the protector of pregnant women and childbirth. There were many magic protective amulets given as gifts depicting either the goddess or her symbol of the frog. Egyptian women looked to her for protection during pregnancy and childbirth and wore talismans with her image. According to ancient Egyptian mythology she was the wife of Khnum the god of procreation who moulded the child and its ka within the womb, giving it the breath of life and then maintaining the health of the infant child after birth. 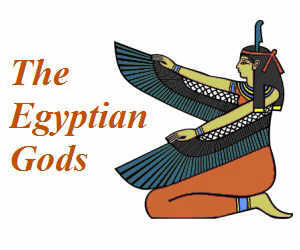 She was first mentioned in the ancient Pyramid texts during the period of ancient Egyptian history known as the Old Kingdom (2686 to 2181 B.C). She is often depicted with magical ‘knives’ of ivory, also referred to as magic wands. These were popular during the Middle Kingdom as devices to ward off threats to families and the fro-goddess was perceived as a defender of the home. Ivory magical knives were believed to protect women at the moment of childbirth. The ivory handles were decorated with a images of powerful spirits who would magically turn their aggressive instincts against those who might do evil to the mother and child. There are the ruins of a temple to the goddess at Qus in Upper Egypt which was a major trading center and the point of departure for expeditions to the Red Sea. She was also associated with resurrection and an amulet depicting the frog-goddess, when laid upon a mummy, was believed to contain her protective powers. Facts and information about Heket for kids with some amazing, cool and quick information about ancient Egypt and Egyptians. These fast interesting facts about Heket are ideal for children, homework, schools, teachers and kids of all ages.